For those of you on a Verizon prepaid plan, be on the lookout for changes coming through around February 1. Big Red plans to adjust the current $80 smartphone option, by offering two new options at $70 and $60. The $70 plan provides users with unlimited talk and text (same as the old plan), along with 2GB of 3G data. The $60 plan offers up the same unlimited talk and text, but only provides 500MB of 3G data. The current plan runs $80, and includes unlimited talk and text with 1GB of data. 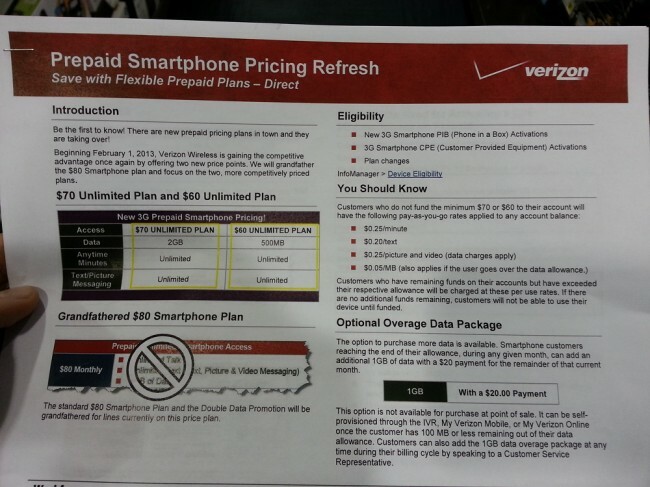 However, Verizon is offering up 2GB of data as a promo to those that sign-up for the $80 plan before January 31. Obviously, you would want to switch down to the $70 plan once it goes into effect. We should point out again that Verizon’s prepaid plans only support 3G data. There are no 4G prepaid options at this point. In fact, the only phone options you have are the HTC Rhyme, Samung Illusion, and some Blackberry device that’s probably from the 80s. NVIDIA Looks to Enter the Smartphone and Tablet Manufacturing Game By Way of "White-Labeling"